Whatever your goal is, to reward a client, congratulate a staff member, promote a product or provide incentives for your sales force, Double One gift card is always your ideal option . With a wide range of furniture for home & office and a variety of homewares, prints & decorator pieces, Double One gift card makes your rewards unique to whoever you want to say thanks to. Double One gift card will valid for 12 months from the date of issue. Double One Gift Card is only available at participating Double One stores. 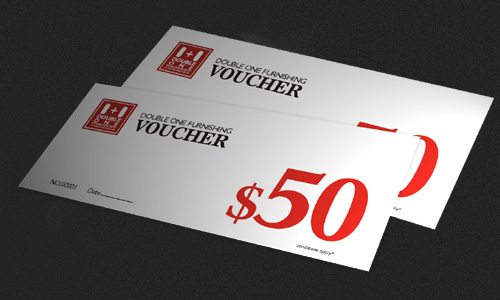 This gift voucher can be redeemed at any Double One store in Australia for Double One merchandise only. Change will be given in the form of a Double One gift voucher. If lost or stolen, this Double One gift voucher cannot be replaced. Gift vouchers are valid for a twelve month period from the month of issue.